The conference will be held at an astounding palace: The Negresco, in Nice (France). 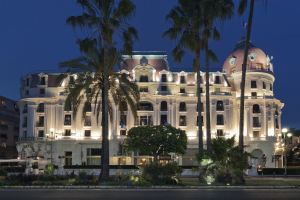 Legendary Palace overlooking the Promenade des Anglais in Nice,Le Negresco undeniably evokes « the art of French living. » Facing the Mediterranean Sea, it is located 5 km from the international airport of Nice Côte d’Azur, and halfway between Cannes and Monte Carlo. This incredible Palace has recently been adorned with the modernity of the Third Millennium, in order to perpetuate its legend throughout the world. 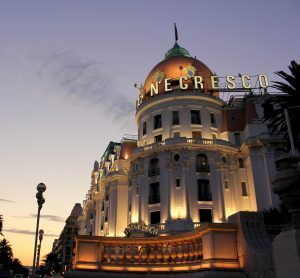 Actors, politicians, writers, singers, artists and royalty, a number of whom have signed the Livre d’or , have enjoyed a holiday on the Riviera to live a little of the myth of Le Negresco. The myth is Jeanne Augier who is also the guardian. Hotel owner and CEO, this great lady – with strongly held beliefs – has devoted her life to preservingand enhancing this unique heritage. A visionary, she was able to meet the expectations of a demanding clientele in search of the exceptional. The city of Nice has the second largest airport in France; therefore it is very easy to arrive by plane from many destinations throughout the world (direct flights are available from most major European cities). The airport has two terminals: T1 and T2 and a free shuttle connects T1, T2, and all Car Parks every 10 minutes. Schedules and information from « Ligne d’Azur » traffic agencies. Take the exit 50 « Promenade des Anglais ». The TGV Méditerranée high-speed train links Paris & Nice in 5 h 30 min. Visit the SNCF website www.sncf.com for more schedules and to book your travel. Vélo Bleu (or Blue bicycle) is an easy to use self-service bicycle rental system.